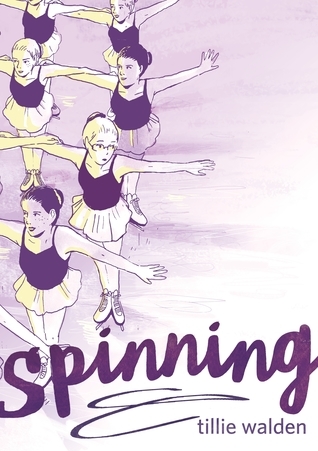 “Spinning” (First Second 2017) is Tillie Walden’s graphic novel memoir about living the disciplined life of a competitive skater. The story follows Tillie from a very young age to eighteen years old, and a move from one skating program in New Jersey to a less elite program in Texas, giving the reader a somewhat varied look at this competitive world. Every morning young Tillie, unsupervised, gets up at 4:00 a.m., and makes her way by bus, in the dark, to takes figure skating lessons. After school there’s synchronized skating and on weekends there are competitions, which she frequently wins or places. At times, Tillie finds a certain ecstasy in skating. Plus it takes her away from being bullied at school and from tensions within her family. Her parents pay her fees, but no family member attends her competitions. There are rink fees that Tillie is unaware of and hasn’t paid and other skaters’ mothers cruelly bring this to her attention. It makes you wonder about this competitive world. Are the mothers more competitive than their children? Does competition promote cruelty? Which is better? An aloof family or a hovering family? The illustrations superbly show Tillie growing up over the years, as well as the emotional strain that she feels—without the whiz-bang-pow that is found in so many comics. One feels Tillie’s isolation, her sadness, her awkwardness. The drawings also show the beauty of the body skating, that only a skater/artist could depict so accurately. You feel the chill of the ice rink. You experience the odor of artificial freezing. Each chapter opens with a specific skating trick and Tillie’s personal connection to it—such as “A camel spin is basically a spinning spiral. It was a dizzying move and always sent my glasses flying off my face.” Or flip jumps. “I loved flips. You would launch yourself in the air by slamming the tip of your blade in the ice.” The pictures show the moves. You feel Tillie’s strength—both physically and emotionally. She seems to have little or no adult guidance, except from her coaches. Early on, she knows she’s gay. One of her early skating coaches is the object of her affection and perhaps this young woman is why Tillie continues skating. The coach cares about Tillie—really sees her. Tillie finds her first girlfriend in middle school—which is very sweet—until a parent disrupts the relationship. The honesty of the story, without sensationalism of any sort, gives this book so much integrity. We see Tillie soar and fall, soar and fall. As an aside, Tillie takes cello lessons, and eventually she’s able to confide in her teacher—another wise woman to whom Tillie gives credit. Along the way, Tillie finds art, which draws more of her passion than skating or music does—and for this, the reader can be grateful. And all this from an author who is just now twenty-one years old. I feel certain we’ll be seeing more from the talented Tillie Walden.